I know, I know. 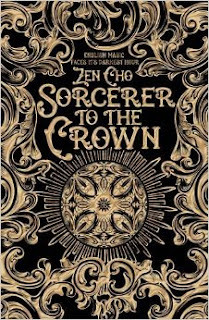 EVERYONE is raving about Sorcerer to the Crown and Zen Cho. I actually didn't request it right away from the library because of that whole ridiculously-high expectations thing. But I was told that it was totally my kind of story and I caved. Then ... I loved it. So what does this story have that makes it so great? -- An alternate Regency London/England that has magic, naturally. I don't think I have to explain why that is the best setting possible. -- Discussions of race. 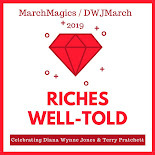 One of the main characters is Zacharias Wythe, an emancipated slave, rescued in his youth and trained in the ways of magic by the Sorcerer Royal of England. Needless to say, the majority of the other magicians are not his fans. -- Discussions of gender. The other main character is the unfortunately-named Prunella Gentleman, who, despite the belief that women cannot handle magic, seems to have an exceptional aptitude for it. She's multi-racial as well. -- Dragons and fairies and familiars. It's probably all because of Hedwig, but who doesn't love a good familiar? -- Politics. English politics, fairy politics -- it's all good. I'm sure I've missed something else awesome. After all, I rushed through the story quite quickly. I couldn't help it. I had to know what was going to happen to Zacharias and Prunella and all of the magic of England. Anyway, if any of this interests you, you should pick up the book sooner than later. I'm going to buy my own copy -- hopefully with the gorgeous UK cover shown above! All right, it's official: I really want to read this! I just put in a purchase request at my library. I'm so glad you loved Jackaby! And I really think you will love this. It's just a fun story with a lot of unexpected elements. I'm beaming stupidly that you liked this. Isn't it a fun book? I've been worried that I'm overselling it, but it's just so purely FUN, I want everyone to read it! I was so worried that you (and everyone else) were overselling it too! ;) But it truly is fun. Someone asked me about it while I was reading it and I thought Jonathan Strange without the footnotes and history and war.